Continuing with the Fantasy Printshop insignia sheets, this one is pretty much like the previous one but the next scale up. 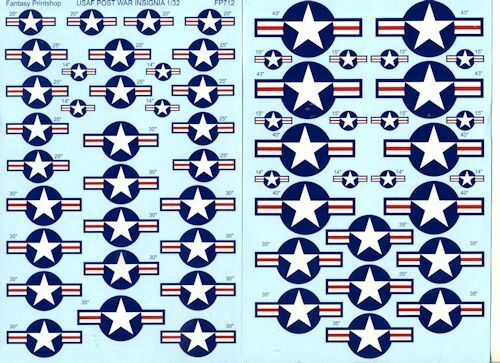 These are post-war US insignia in 1/32 scale. These sheets are quite useful if the kit decals are poorly done or the wrong size. There are at least four insignia in each size and more in some of the smaller ones. These are 43", 40", 35", 30", 25", 20", 15" and 14". Due to the size of the markings, Fantasy Printshop offers two full sheets. The markings are very nicely printed and have no registration issues. It seems that they have the proportions correct, something that has been an issue with some other decal companies. A handy sheet and one that will be useful.